Last week in Fortnite, an in-game rescue attempt to help a trapped player went awry. The incident achieved near-memetic status, and Epic added a tombstone into the game commemorating the fallen player. Now, players hold mock funerals, and they’re going just as poorly as the bungled rescue. It all started when the streamer Muselk happened upon a stranded player last week. The player, Chappadoodle, had fallen to the edge of the game’s map where it’s not possible to build. Muselk mounted a rescue attempt, building stairs as close as he could and driving off a cliff with a golf cart. The plan was to use the cart to bounce to the stairs, but the cart careened into Chappadoodle and knocked him to his death. 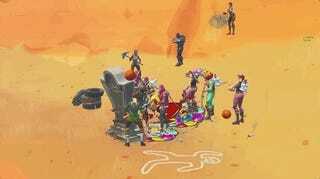 After Epic added a tombstone to the game in memory of event, players attempted to organize a funeral. Community members organized the event using the game’s Reddit, calling on players to queue into the game’s Oceanic servers and head to the tombstone. Fornite’s Oceanic servers are often used for player gatherings, as lower player numbers cut down on the amount of trolls who might ruin events. However, a Reddit user with the unfortunate name thederpytroller managed to ruin one of the gatherings by destroy the tombstone with a pickaxe. Thederpytroller claims it was an accident. “So, I didn’t realize the grave was breakable at Chappadoodle’s funeral, my apologies everyone that was there,” they said on Reddit. Destroying Chappadoodle’s grave set off a violent chain of events. The gathered crowd quickly turned on thederpytroller, smashing them to death with their pickaxes. Some players tried to dance and keep things relatively civil, only to be blown up by grenades. It’s common for Fortnite gatherings to go wrong. At the start of the month, a troll nabbed a new kill record after destroying a platform where players were watching an in-game rocket launch. 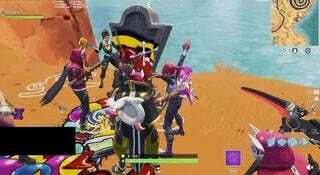 This bungled funeral wasn’t quite so big, but it might be a good reason for Epic to turn Chappadoodle’s gravesite into a full-blown graveyard.